Beautiful real estate agent Annie O’Sullivan is just finishing up an open house when her world comes crashing down. That’s when David arrives, begging for an opportunity to see the house before she packs up. David, however, isn’t what he seems and Annie’s life is about to get ugly. David abducts Annie and holds her captive for many months in an isolated cabin in the woods. This is Chevy Stevens’ ( who is very beautiful, btw – not that it matters, but she is) first novel and in many ways, it’s a doozy. The first person narrative alternates between sessions with Annie’s shrink where she recounts the details of her horrific captivity and the details of her arduous journey back to emotional health. 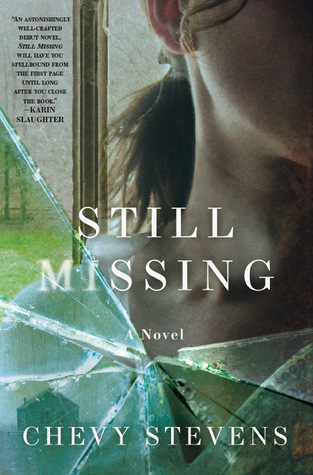 I found Still Missing quite a gripping book. Annie is no shrinking violet. During her time in the cabin she is constantly trying to outmanoeuvre David – not an easy task because he’s batshit crazy. Annie’s fear is palpable, but equally convincing is her desire to stay alive and it’s that motivation that keeps the story humming along. What didn’t work so well for me was the novel’s resolution. I’m one of those people who doesn’t need the neat and tidy ending, loose ends gathered into a orderly bow. Likely most readers won’t be bothered by how it all ties up because the mystery of who orchestrated Annie’s abduction isn’t really what’s facinating about Still Missing. This entry was posted in Book Chat and tagged 2011, Canadian, popular fiction, prize winner by Christie. Bookmark the permalink.